Light and airy, this design award-winning conversion was completed in 2014. 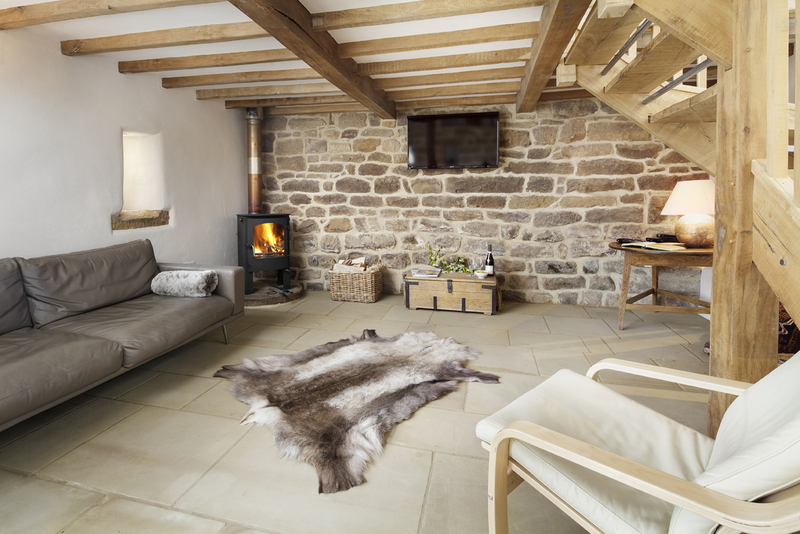 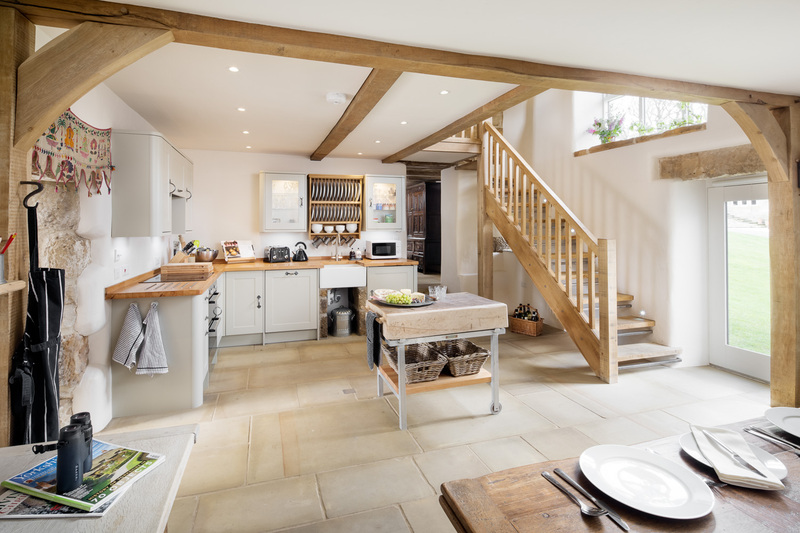 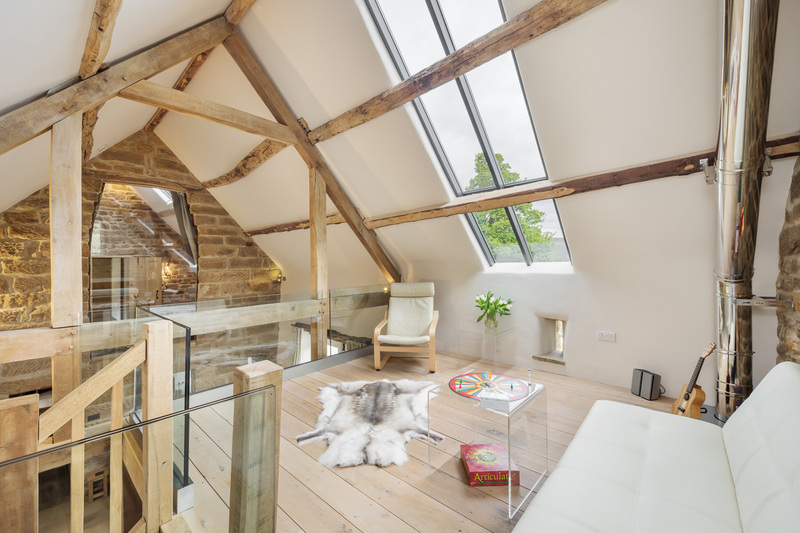 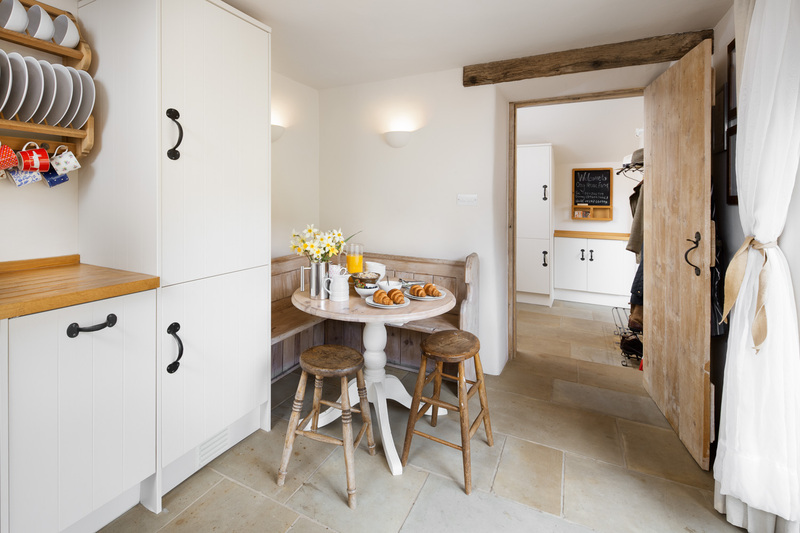 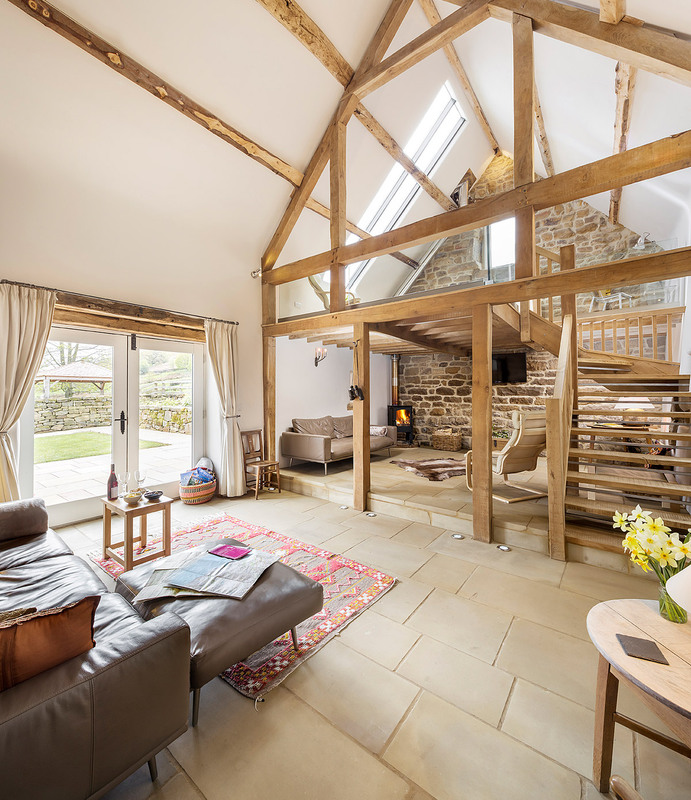 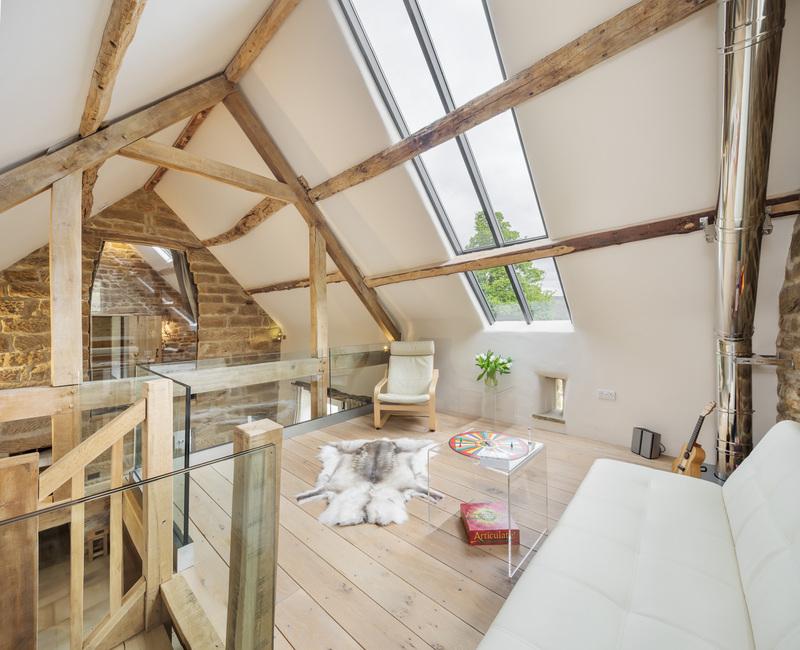 Green oak timbers and light York stone floors create a feeling of warmth and tranquillity. 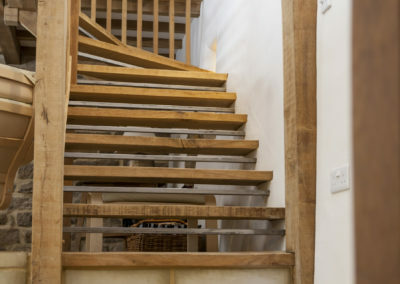 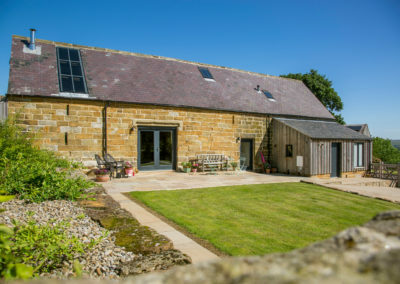 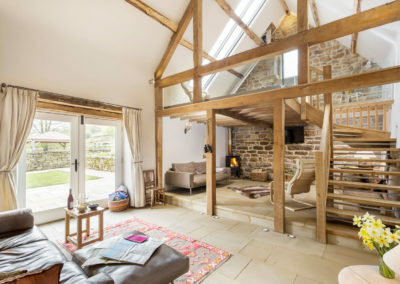 A stylish and sophisticated barn conversion with lots of quirky and unique aspects. 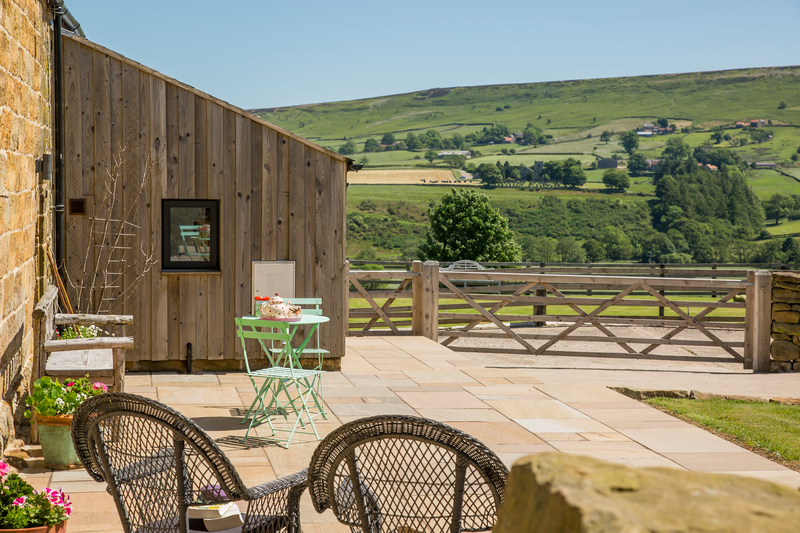 Dale View overlooks picturesque Danby Dale. 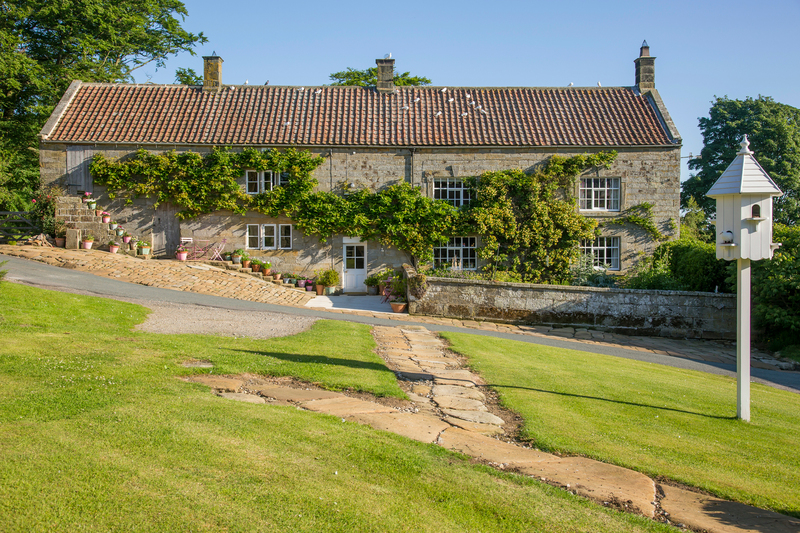 It is detached and has its own private gardens and covered area for al fresco dining. 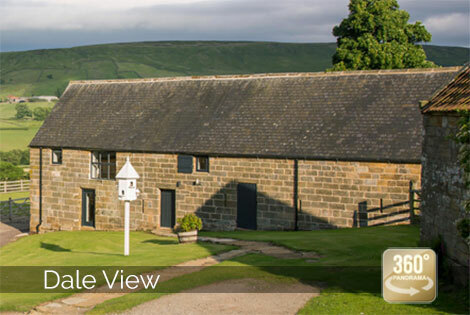 For a really immersive experience of Dale View, try our 360° virtual tour below. 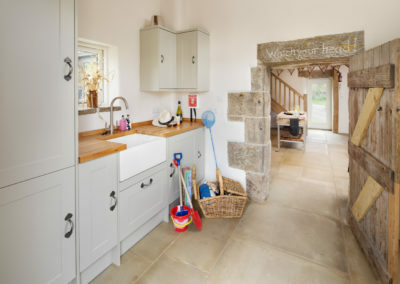 A brilliant space for coats, boots and all the paraphernalia you need on a good Yorkshire holiday. 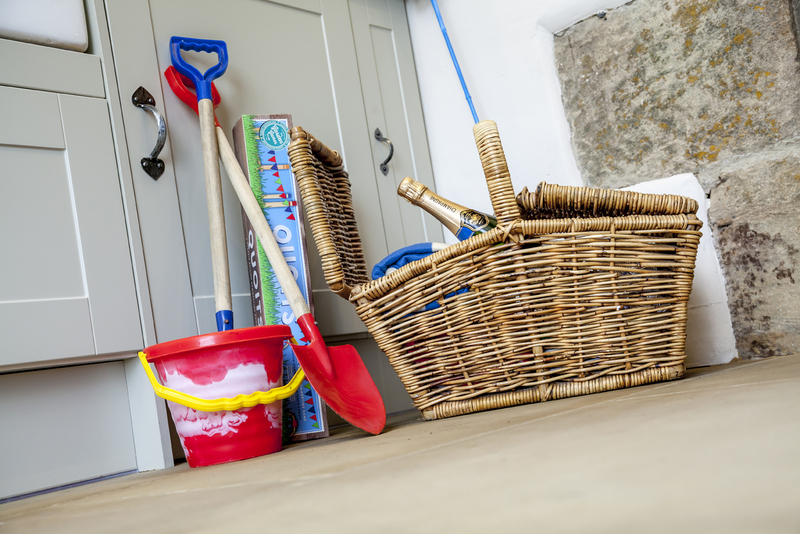 Equipped with integral washing machine, tumble dryer, freezer, Belfast sink and drainer, iron and ironing board, and children’s plastic crockery – the utility room has everything you need to stay comfortable and organised throughout your holiday. 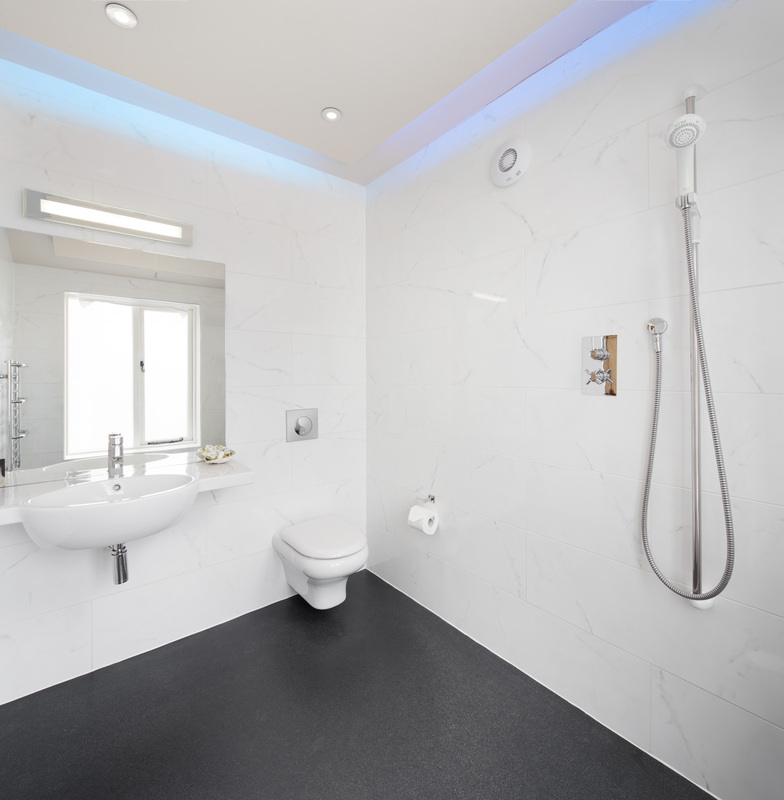 Comes with marbled tiles throughout and a non-slip floor. 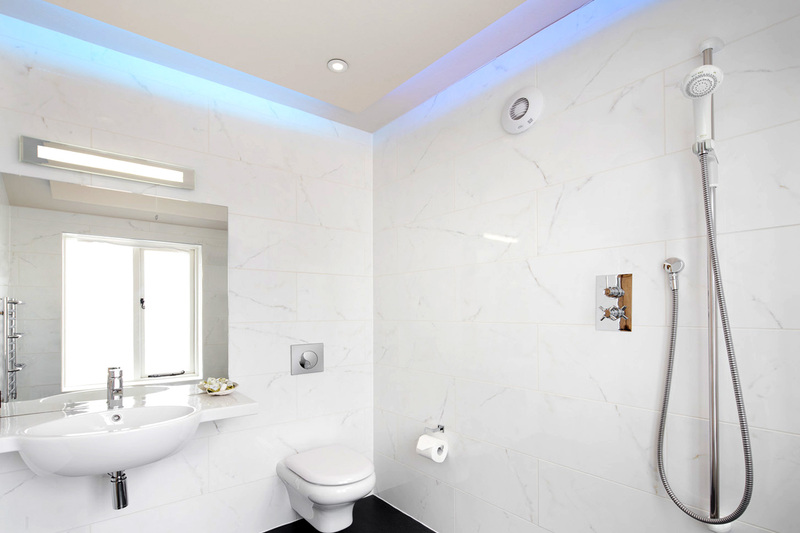 There’s a large spacious shower area, an Italian loo and hand basin suite – It also boasts a fun colour-changing LED disco lighting system! 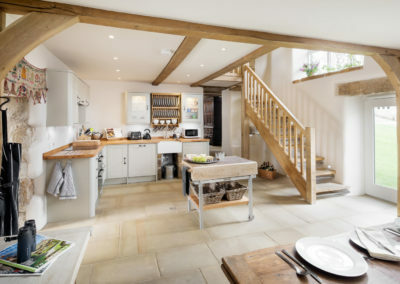 The old weaver’s window pours light onto the green oak stairs in a kitchen furnished with antiques. 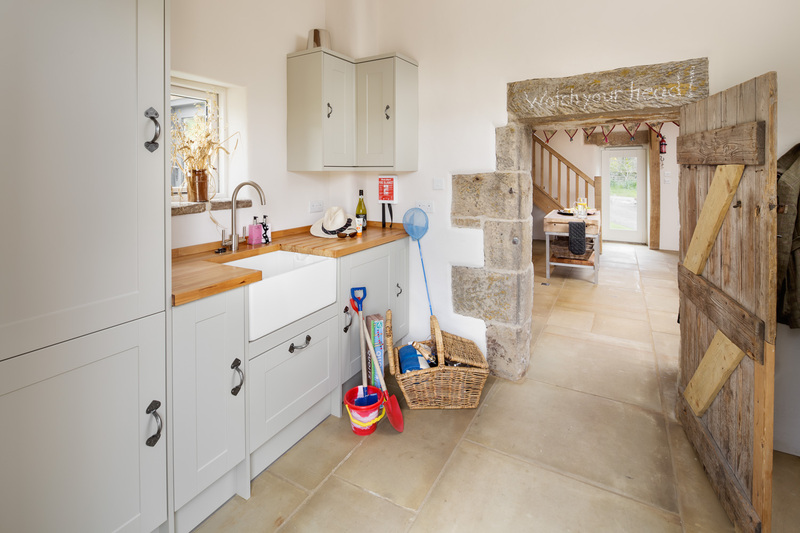 An old oak pew from a local chapel, a school bench and a 17th Century serving table along with the 12 seater elm dining table, sit comfortably within the modern and fully equipped large farmhouse kitchen. 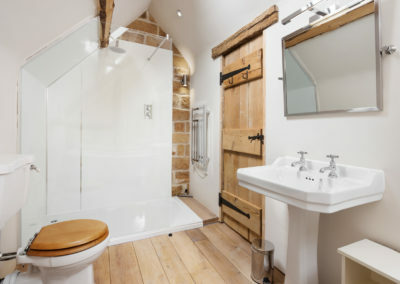 Belfast sink, double fan-assisted oven, induction hob, fridge, dishwasher and microwave cover all the essentials. A butcher’s block has been rescued and converted into a handy mobile island. 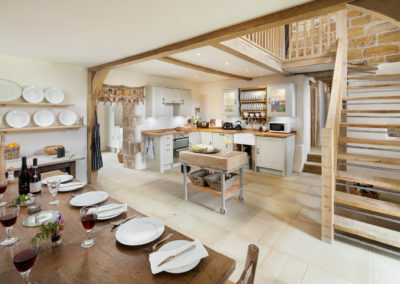 This is a kitchen just begging to host some culinary masterpieces. 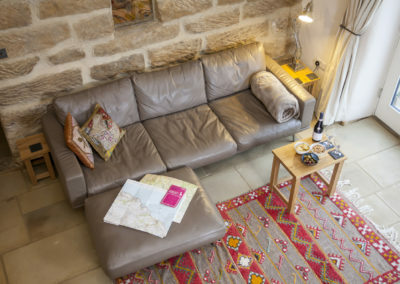 After a day exploring the delights of the North York Moors, come back to relax and put your feet up in this spacious yet cosy 2 level sitting room. 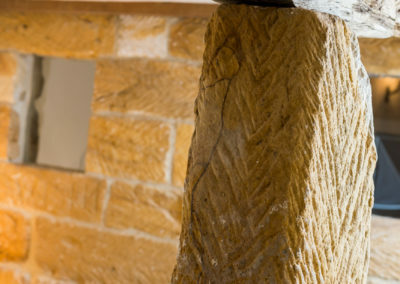 Enter through a stone doorway. 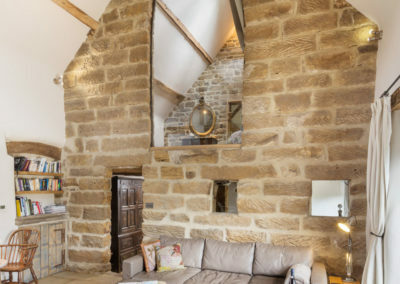 Look up towards the 20ft ceiling and you will notice a huge internal glass window set high in the exposed stone wall. 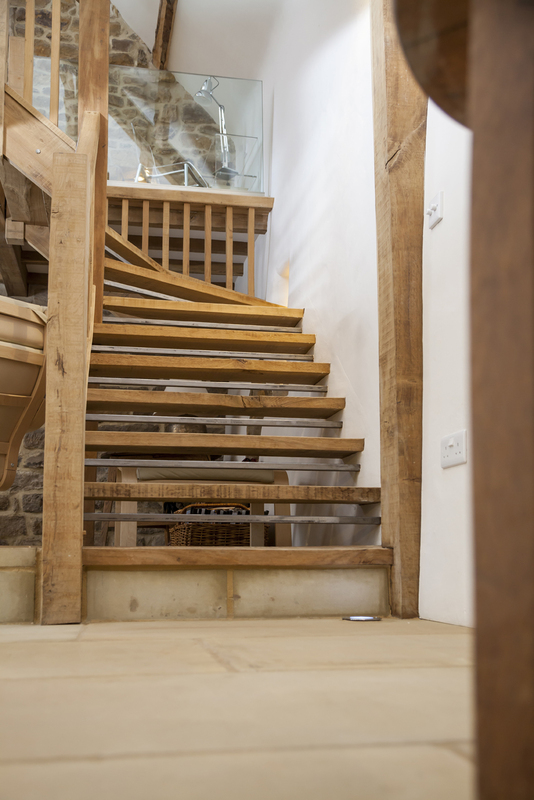 Stairs lead to an oak-beamed and glass gallery. 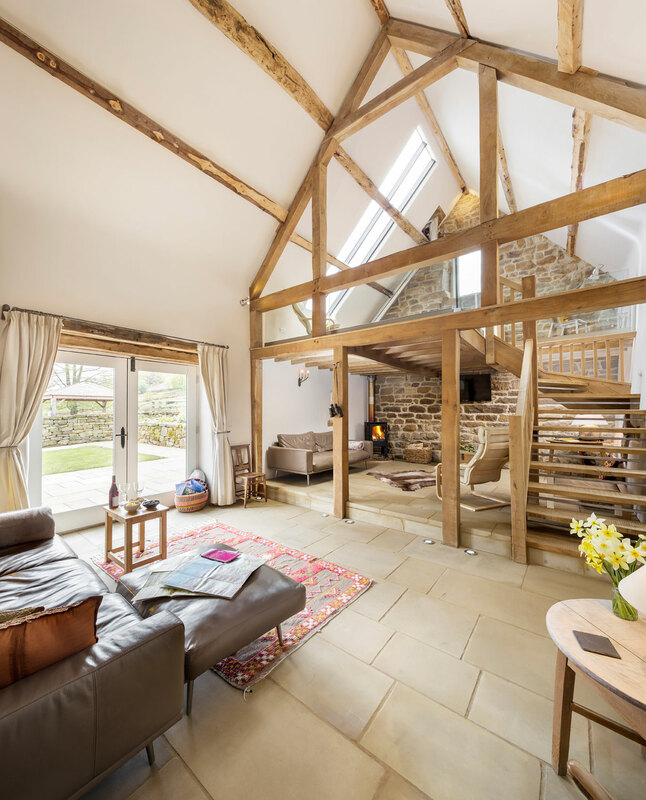 South facing French windows lead out onto gardens with views of Danby Dale. Set the LED lighting to suit your mood, strike up the wood-burning stove, sink into Bo Concept leather sofas in front of a good film on the 55 inch wall mounted Smart Sony TV. 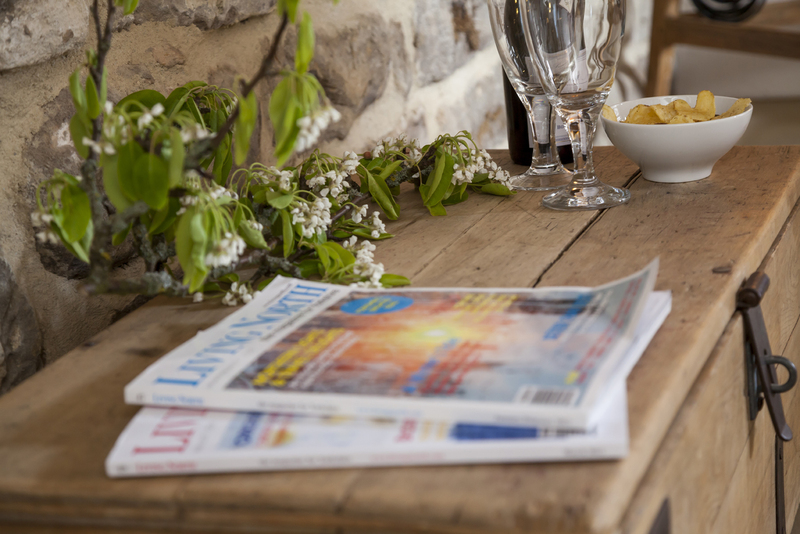 Netflix DVD/Blyray. 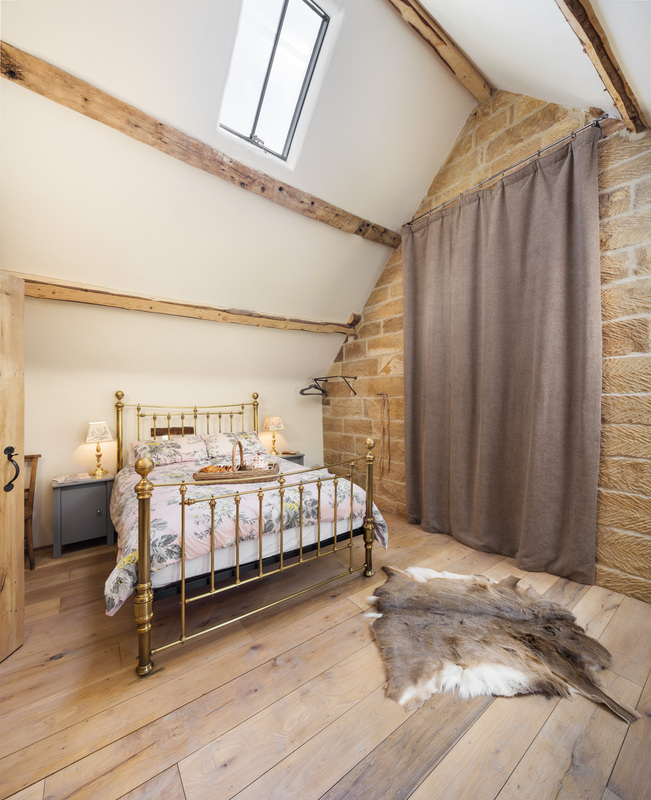 With a pine box full of games, toys and books on the shelves it all conspires to make this a room you will find hard to leave. A westerly window and large south-facing roof light reveal more great views and allow light to flood onto this airy, spacious gallery. 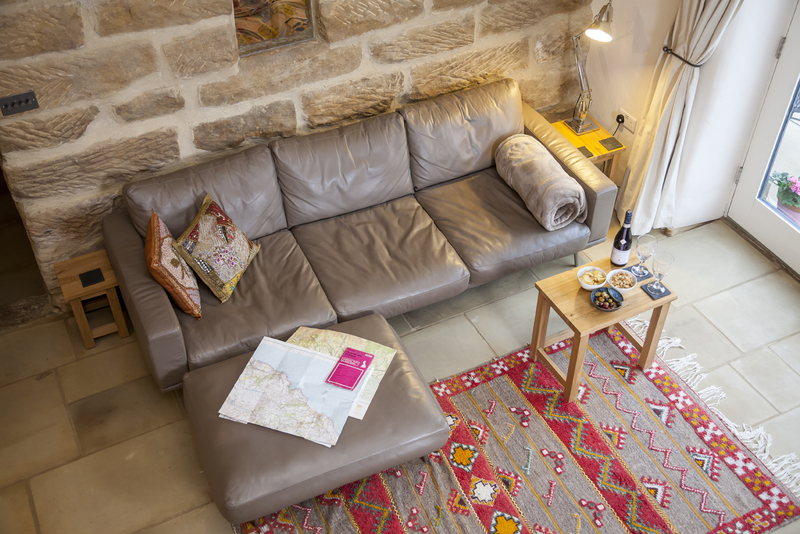 Simply furnished with a cream leather sofa-bed, rocking chair and sheepskin rugs, this is the perfect place to relax, listen to music; read, write, or be creative with watercolours or drawing. 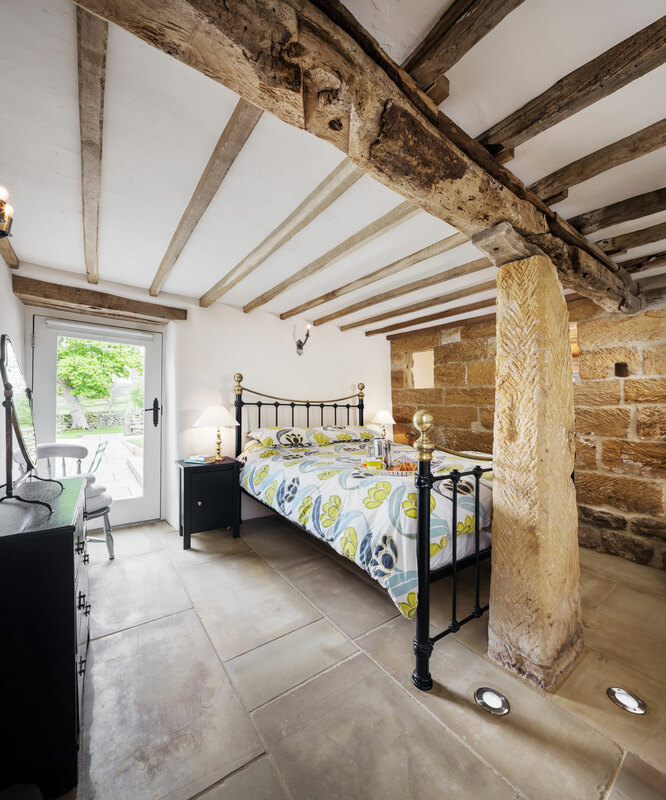 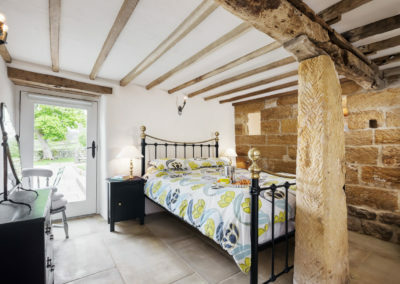 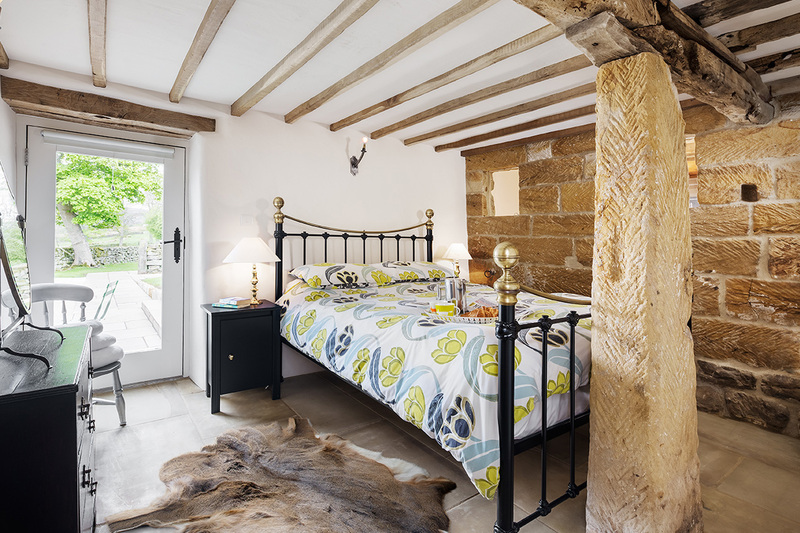 Not many bedrooms have an original sandstone pillar at the foot of the bed. 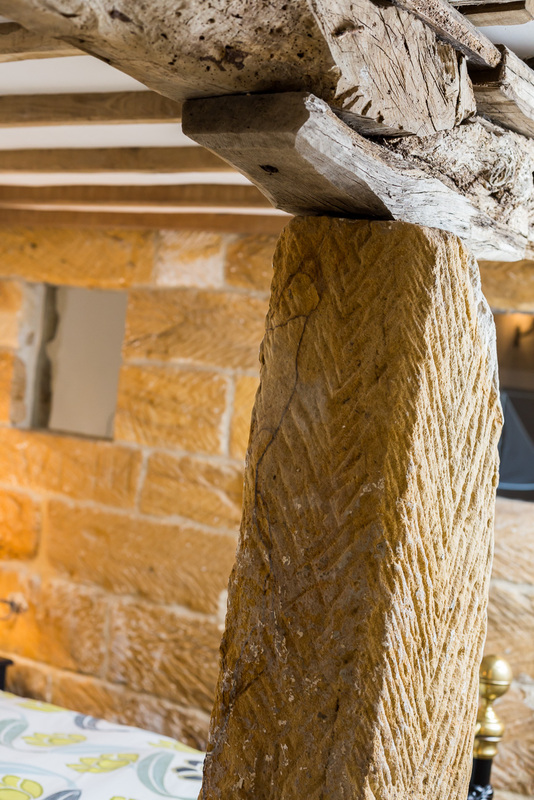 This one does, supporting the ancient oak beam and joists. 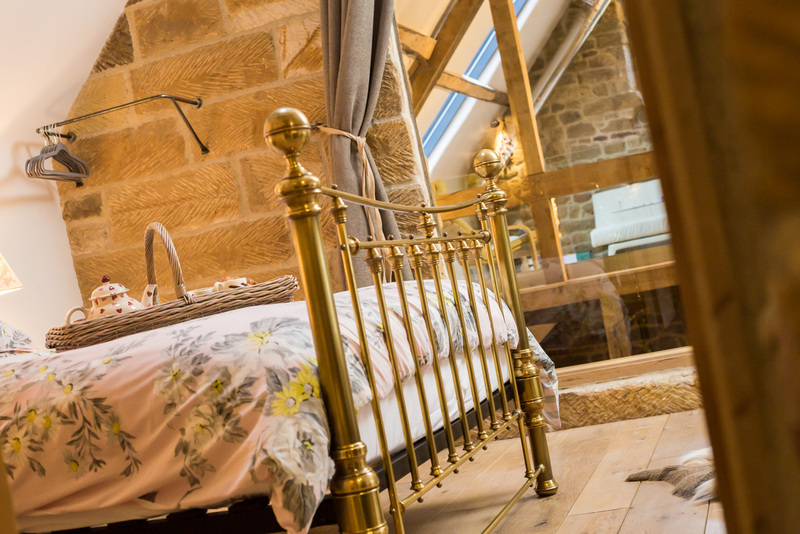 Boasting a luxury King size brass bedstead and 18th c oak chest of drawers. 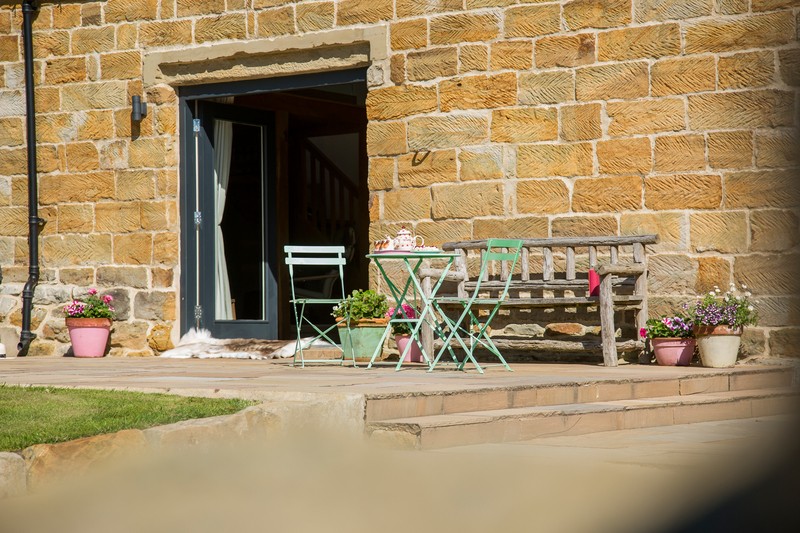 A glass door leads straight out onto the terraced south facing gardens. 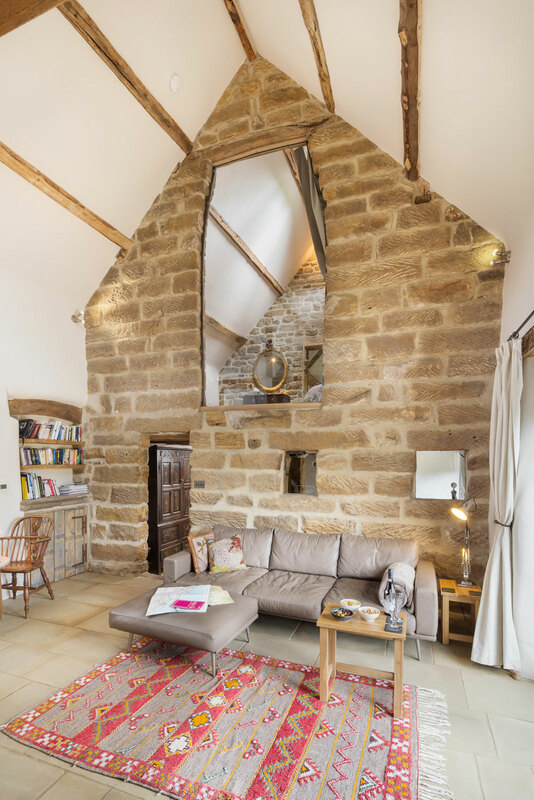 Entering this special room you will be wowed by the 12-foot high internal window looking directly into the sitting room below and the gallery across the barn. 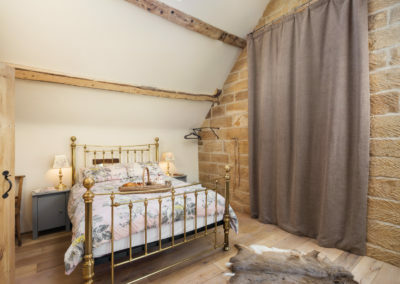 A single heavy curtain can be pulled across and you are in total privacy. 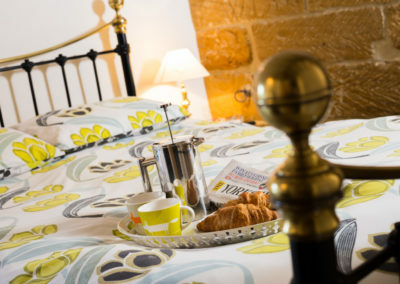 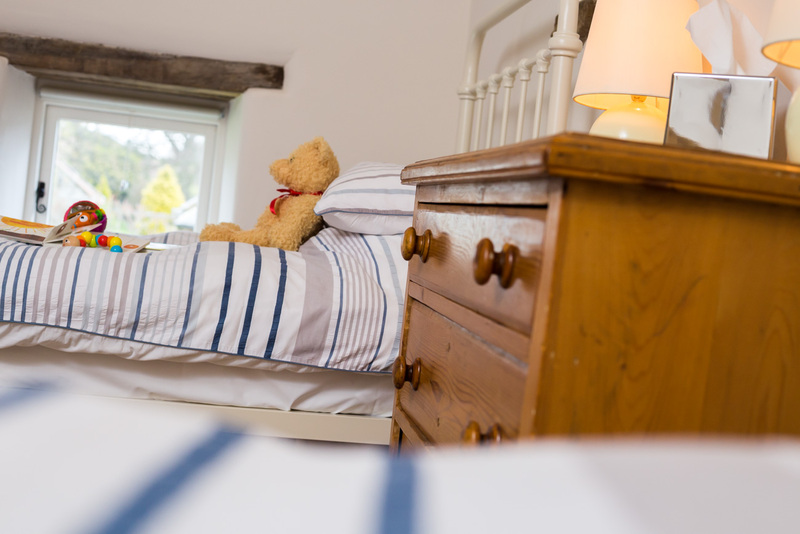 The room has a traditional cast iron radiator, antique mirror and chest of drawers and a comfy luxury big brass bed. 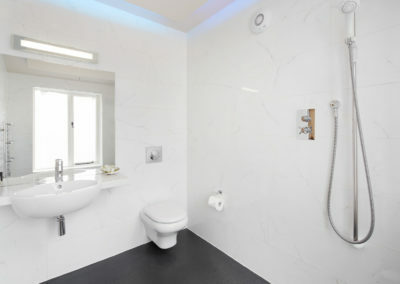 A wall-mounted TV/DVD and LED mood lighting complete the picture. 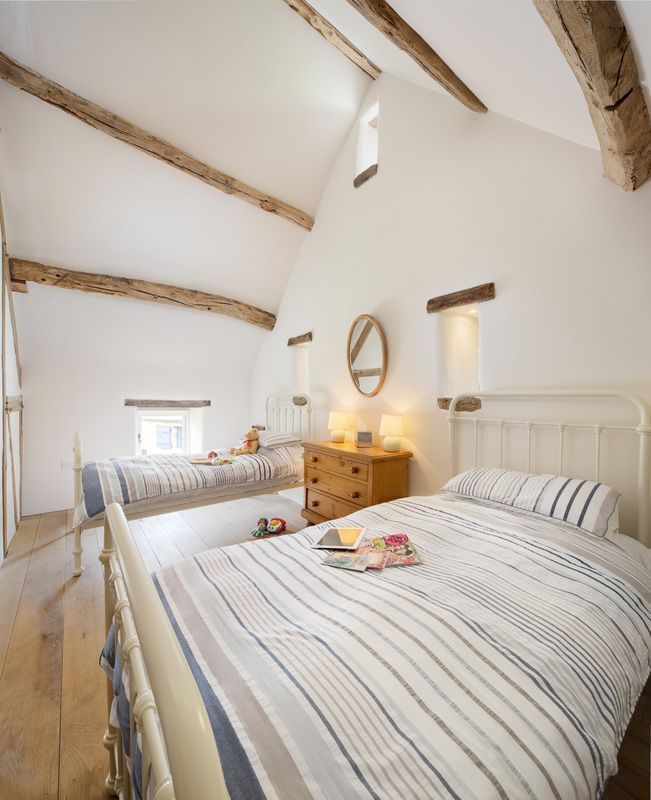 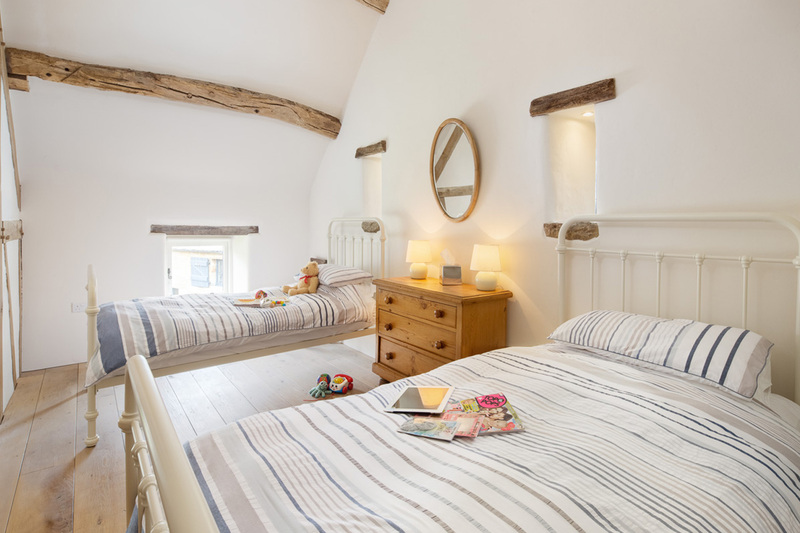 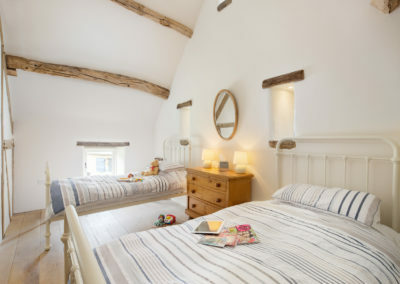 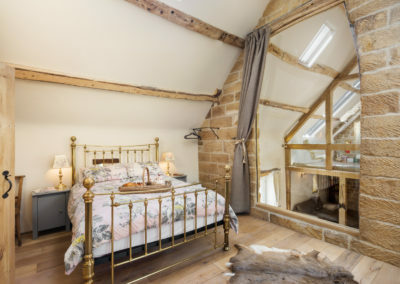 With a vaulted ceiling and illuminated ‘arrow slits’, this simple tasteful room has two 3ft iron bedsteads, a chest of drawers, mirror and chair. Like the master bedroom, this room has a traditional cast iron radiator. 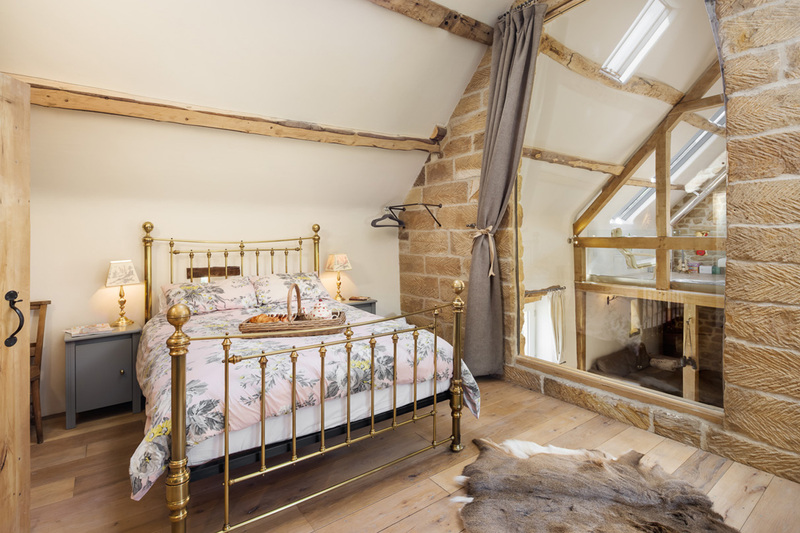 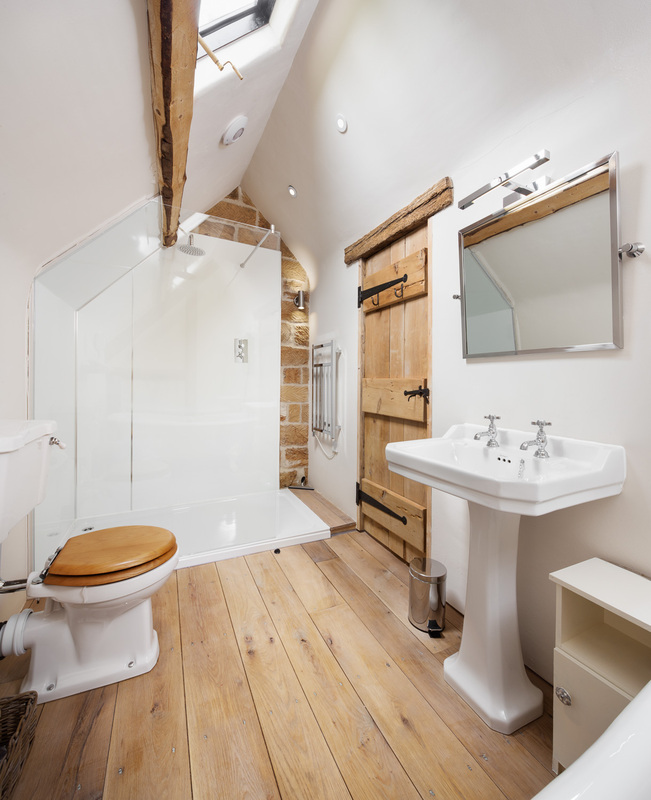 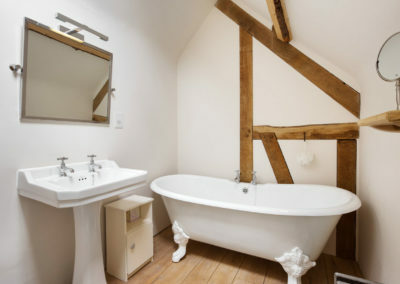 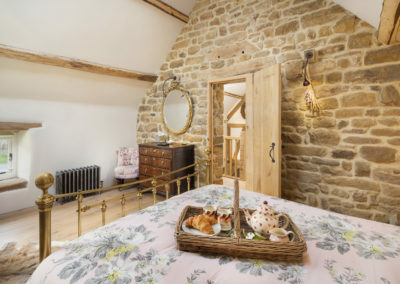 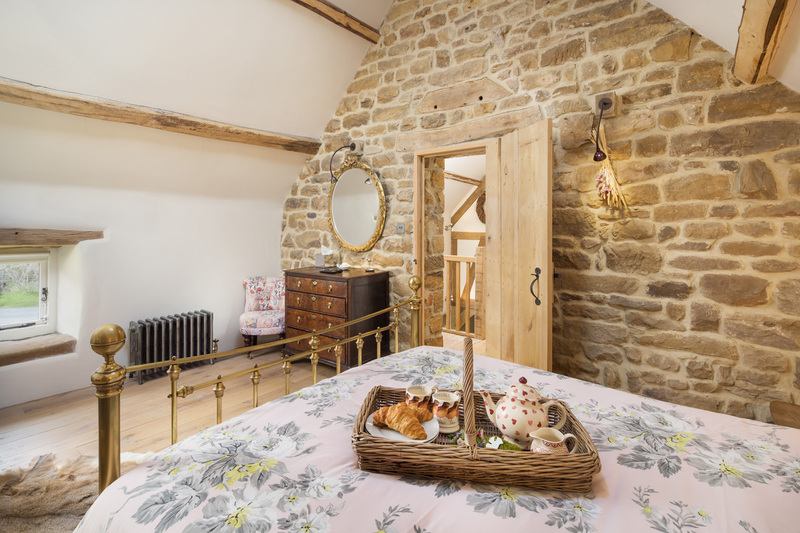 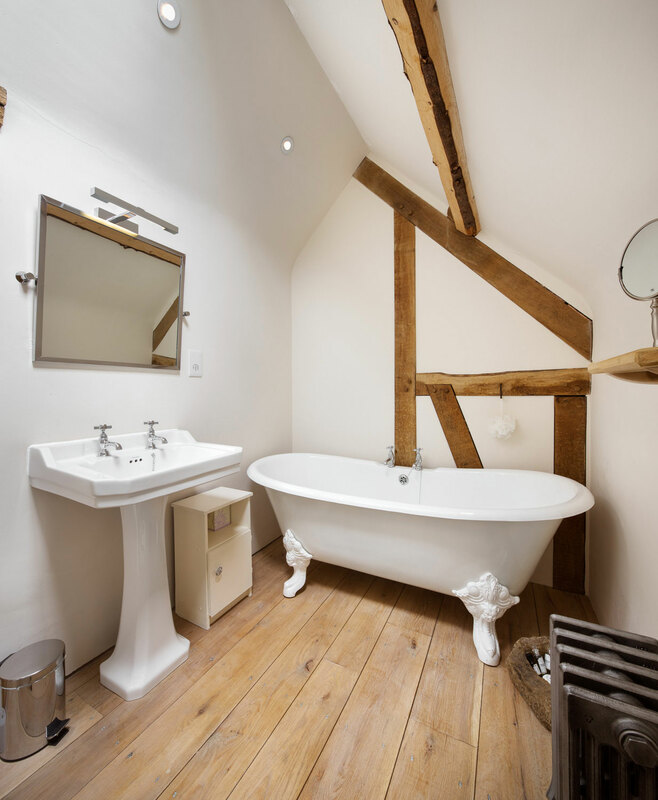 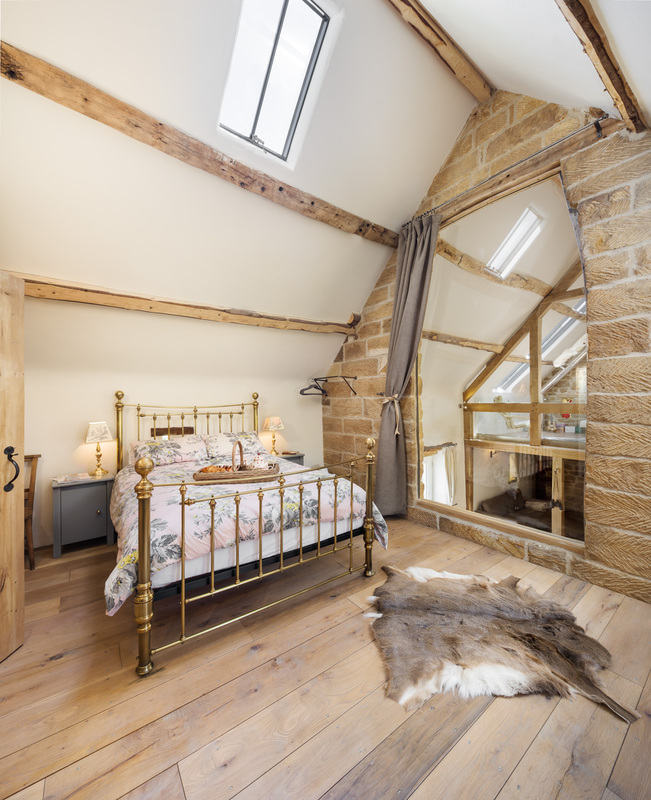 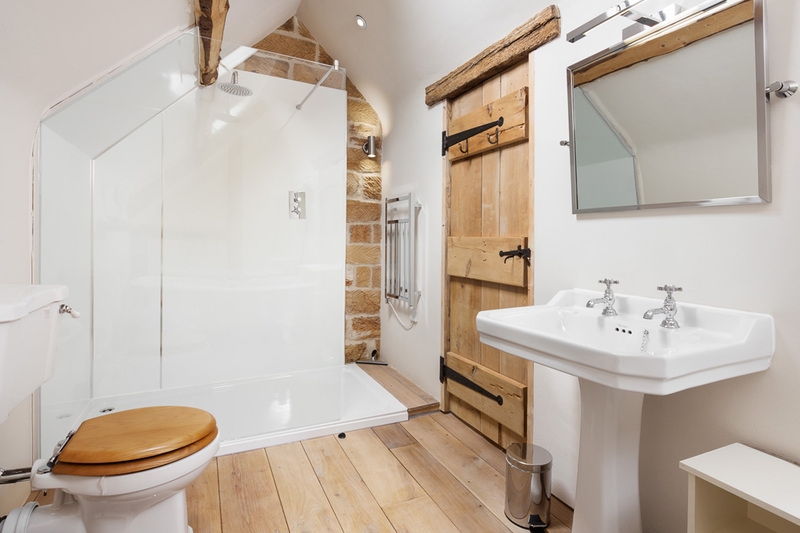 With exposed beams and cast iron radiator, this delightful room features a Victorian style double roll top cast iron bath, loo and hand basin and a separate walk in rainfall shower. 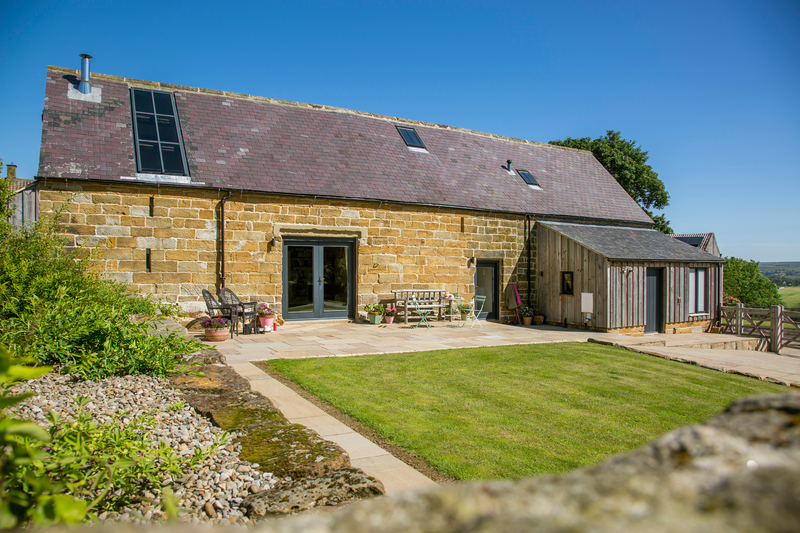 Dale View Barn has 2 private walled gardens. 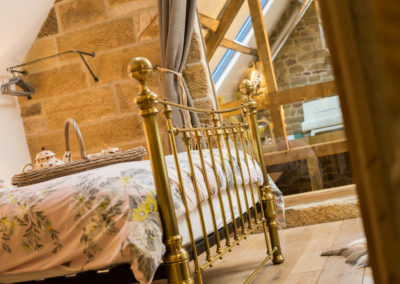 Step out onto the terraced south facing sun trap from the glorious sitting room French windows, the ground floor bedroom or the main entrance. 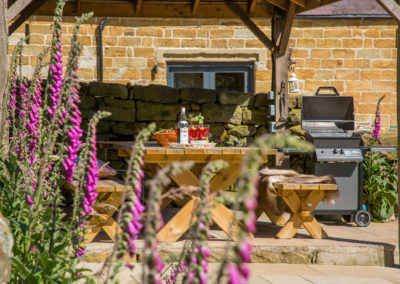 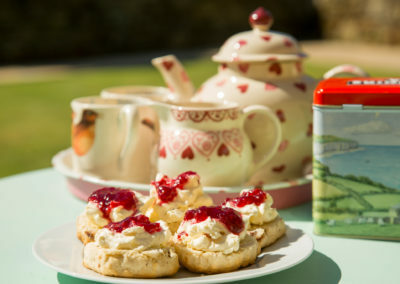 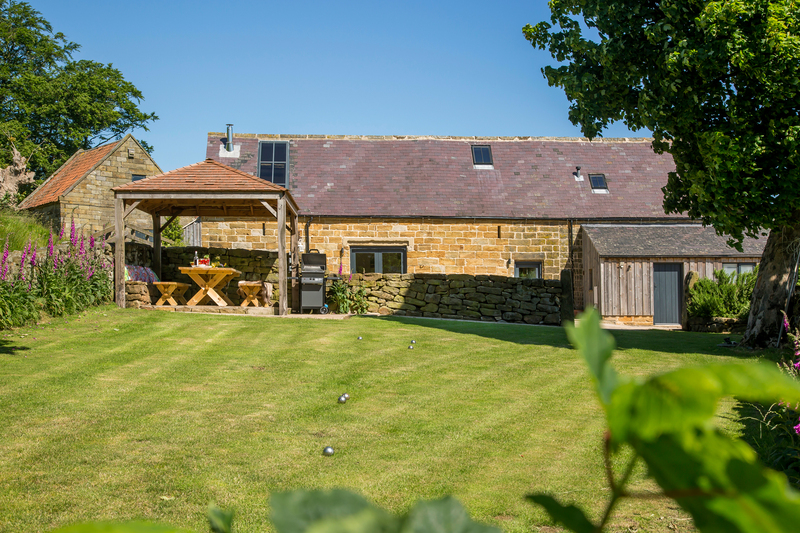 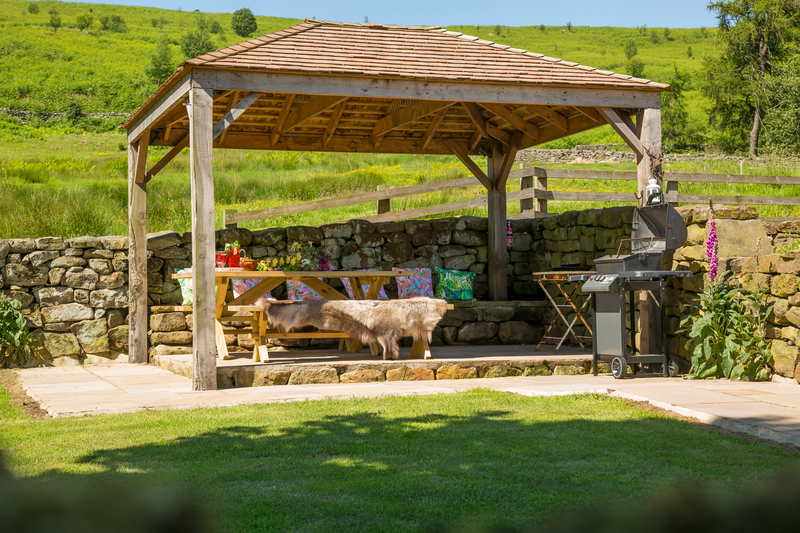 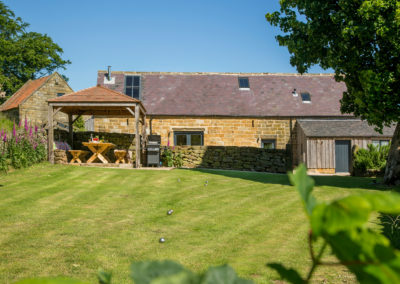 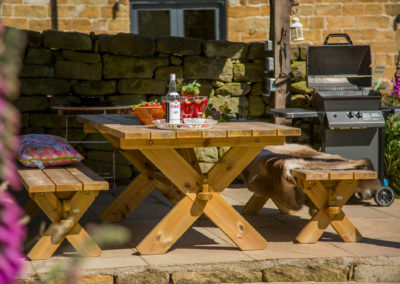 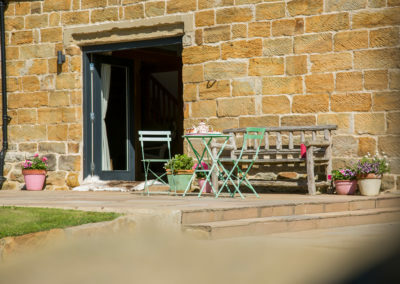 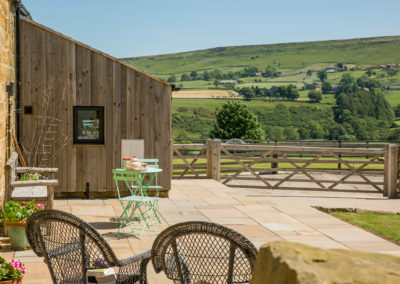 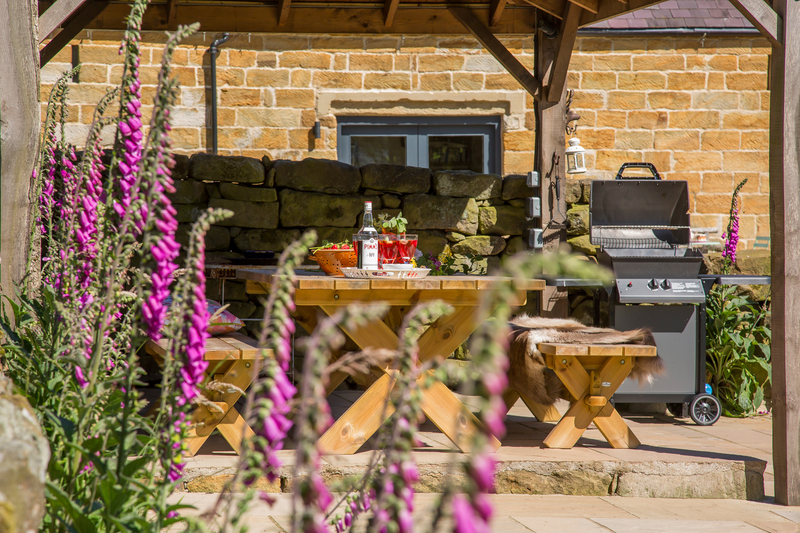 Just the ticket for a summer breakfast in the garden with stunning views of Danby Dale… well it is called Dale View! 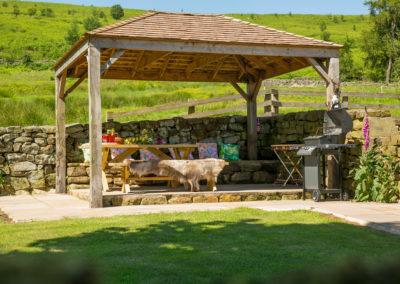 Through stone gate posts to the second garden which once was a paddock for our childrens ponies but now sports an undercover alfresco dining area with barbecue and electric points. 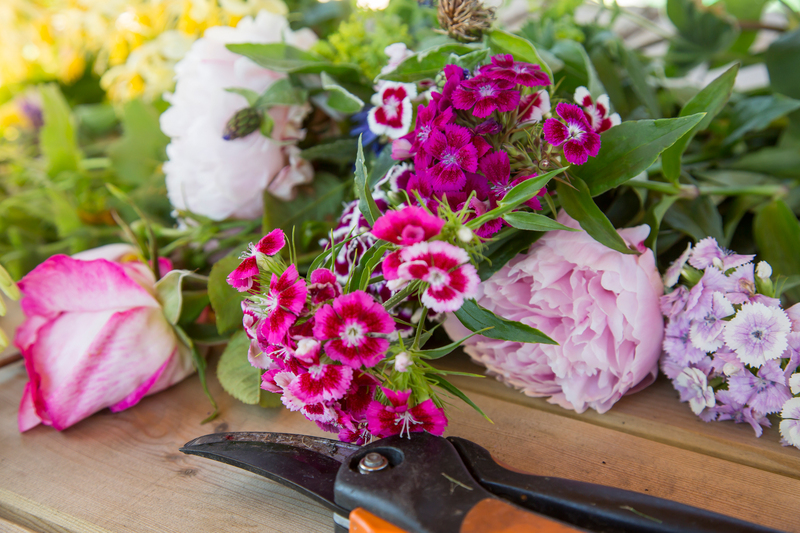 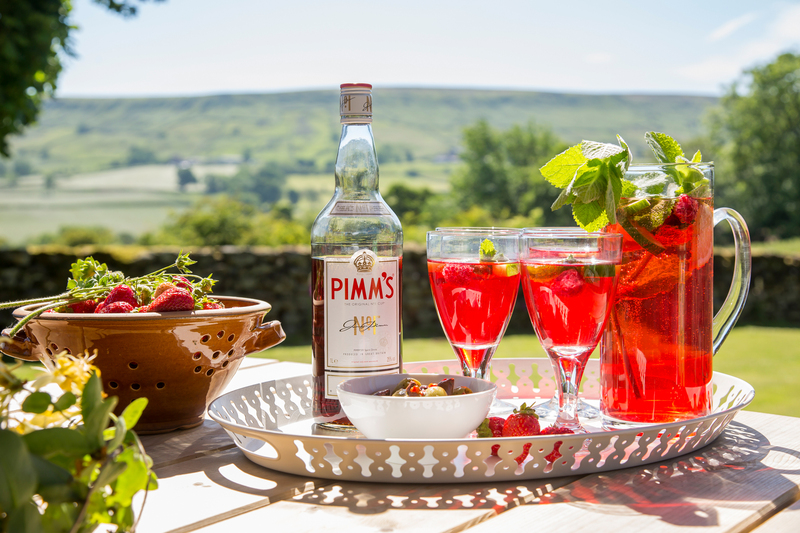 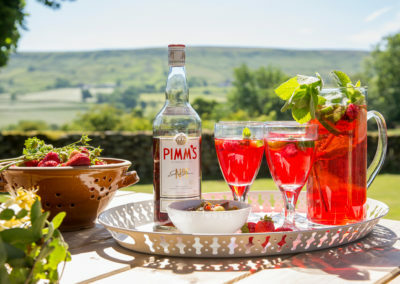 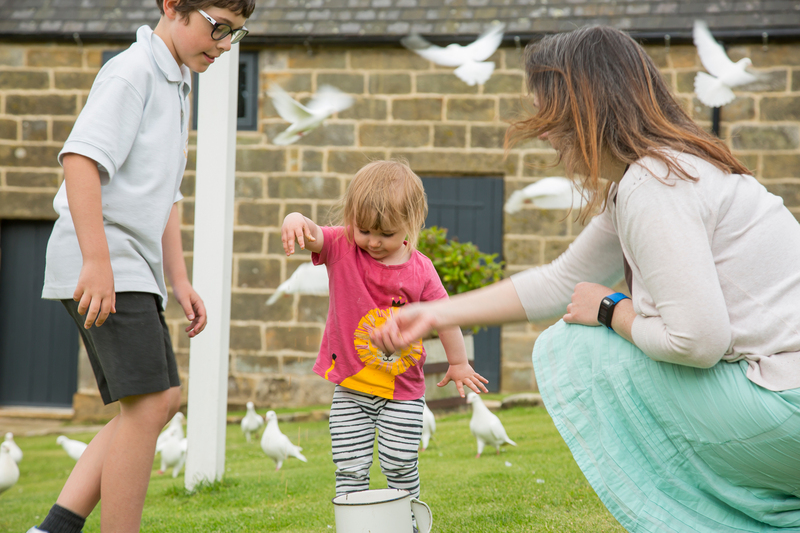 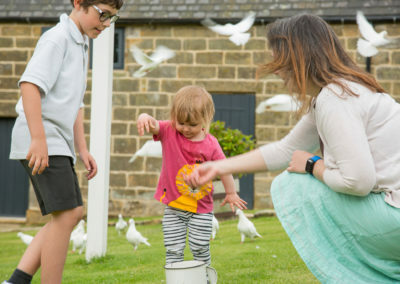 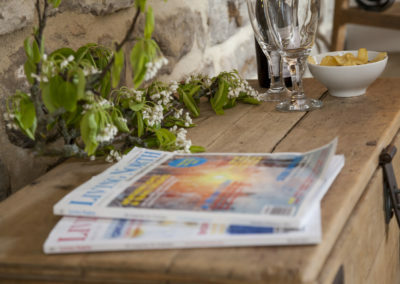 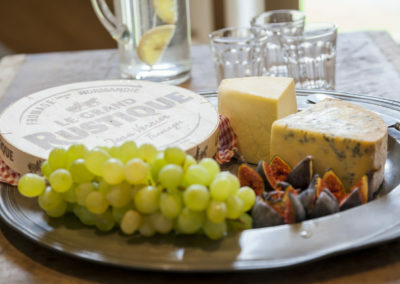 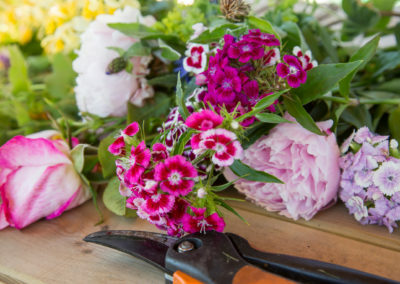 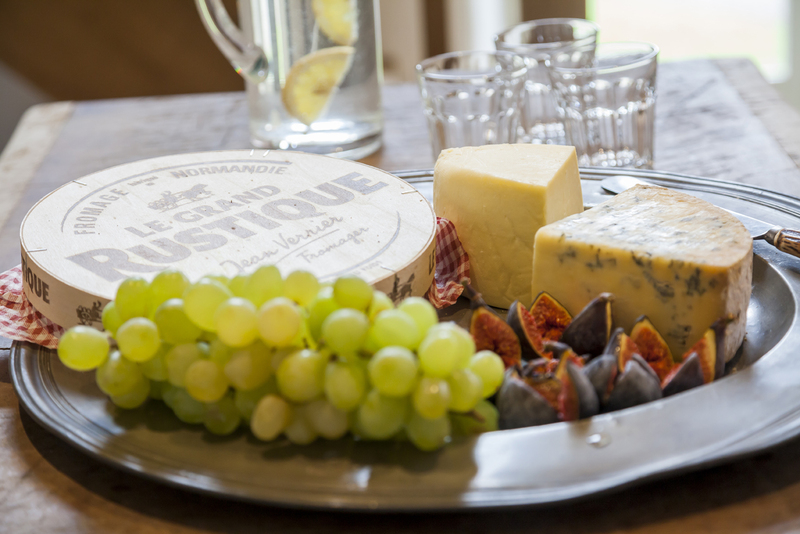 Help yourself to the fresh herbs, while away an afternoon with a game of Boule or try your hand at Quoits – before you know it an impromptu party has begun. 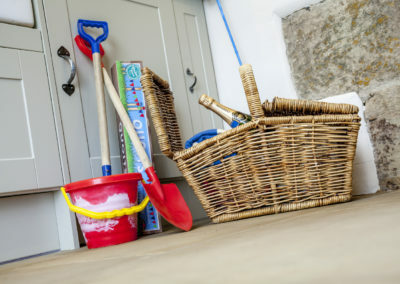 At the bottom of the garden discover a secret childrens living wigwam. 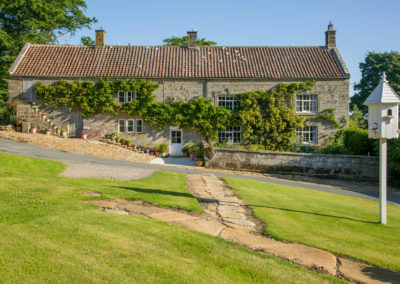 There is designated parking for 3 cars.